For those who regularly travel on business to New York then flying on Virgin Atlantic is highly recommended to experience Virgin’s new and improved JFK Clubhouse explaines guest contributor Simon Colley who writes on behalf of CT Business Travel, an award winning service driven UK travel management company. However, the JFK Clubhouse is not available to everyone flying Virgin, you need to be travelling in Virgin Atlantic’s Upper Class or be a Flying Club Gold member to indulge in and enjoy all the benefits of Virgin Atlantic’s red carpet treatment. 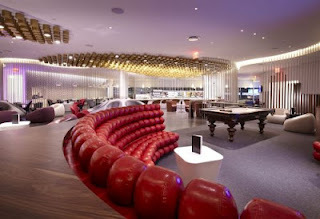 Virgin Atlantic’s new clubhouse is more than double the size of its previous JFK airport lounge, at 10,000 square feet there’s plenty of space for passenger’s to relax and unwind before their flight. No expense has been spared with the new Clubhouse re-build costing an eye watering $7 million, but then we are talking about travelling in the most stylish and luxurious way that Virgin Atlantic know only too well how to excel at. As with Virgin Atlantic’s approach to all its clubhouses, it is unmistakably Virgin, with the JFK Clubhouse design reflecting a completely uptown style as per the city it’s located in. The focal point of the new lounge is the uptown cocktail bar set in the central park lounge. Given all Virgin Atlantic flights departing JFK’s terminal 4 are in the evening, this area is for kicking back and relaxing with one of their signature cocktails. Although given the sheer size of the overall lounge and its many different areas, there’s no chance of people invading your space, as there’s plenty of room for everyone to spread out. In addition to complementary drinks there’s an extensive menu for food, which is available from any location within the Clubhouse, as well as having the choice to eat in its brasserie should you prefer to dine more formally. A further focal point is the huge windows located on both sides of the lounge, providing amazing views over the airport apron and the Virgin Atlantic aircraft sitting at their gates preparing for take-off. Another area customers can enjoy using is Virgin Atlantic’s entertainment zone that includes a billiards table. There’s also the Clubhouse spa, which is only the second Virgin Atlantic Club lounge to feature a spa other than London. Virgin Atlantic have partnered with Bumble and bumble, a renowned New York City salon and product company. Virgin passengers will have the opportunity to purchase Bumble and bumble products as well as them being available for customers to use in the Clubhouse showers. It’s also worth highlighting this is the only hair salon available at any business class lounge across the US. All in all, if you have the opportunity to experience Virgin Atlantic’s JFK Clubhouse – take it, you won’t be disappointed, and that’s only the start of their red carpet service if you’re lucky enough to be flying Upper class too!